The exploitation of the oil fields -- located mainly although not entirely inside Yasuní national park, a global biodiversity “hotspot” -- has aroused some passionate opposition and a determined defence of the decision by the Ecuadorian government. 1. As some commentators have already pointed out, the Yasuní National Park is hardly a pristine area. It has been explored and exploited for decades. Shell oil set up camp there in the 1940s, but abandoned the wells it drilled due to the difficulty of getting the oil to market, and because the crude was heavy: the company was not particularly interested in heavy crude. The structures Shell left behind can still be seen in the area, together with large pools of oil and/or formation water, abandoned, open to the elements. And extraction continues. A number of oil companies are presently working in Yasuní, both multinationals (Repsol , Block 16 , Petroriental block 14) and nationals (Petroamazonas, Block 31). Timber traffickers are also present in the area, and according to Carlos Andrés Vera’s documentary are “supported” by some Waorani. At the same time, just across the border in Peru, the French oil company Perenco is in the process of exploiting block 67, which borders the park’s eastern limit. 2. Block 31, where oil companies have been exploring for a number of years (Petroamazonas took control of the block in 2008 after the Brazilian company Petrobras left), is more of a concern than Block 43 (ITT). The oil fields are more widespread and likely to cause greater impacts (access roads, platforms, pipelines, seismic exploration, etc.). An access road has already been built in the block. But the problems presented by Block 31 have not been widely discussed. The question presented to the constitutional court by environmentalists seeking a national referendum on whether to leave oil in the ground does not mention Block 31. 3. It seems clear that exploiting the ITT fields cannot be equated with “destroying” Yasuní, as some claim. It is difficult, although not impossible, to “sav”' something that is already badly compromised. Claims made by the government side, to the extent that 99.9 % of the park is intact are also hardly credible. A quick look at a map of Block 31, which occupies a large percentage of the park, makes it clear that to say so is a distortion of reality. At the same time, it is farcical to talk about the access paths (several metres wide) that will be opened in Block 43-ITT as being “green”. Of course, paths are preferable to the usual access roads, but calling them “green” is absurd. Furthermore, as noted in the Ecuadorian National Assembly, the “ecological path” between the Tambacocha and Ishpingo fields would be about 30 kilometres long. 4. Although not exploiting the Block 43-ITT fields may not save Yasuní, leaving the oil in the ground would obviously avoid doing more damage to the area. And avoiding damage is clearly significant as the park is an important centre of biodiversity. Extracting oil is always a risk even if the process is well managed. While leading edge technology may help, it will not prevent spills -- it would be would be amazing if it did -- and a spill could easily affect more than the 200 hectares that proponents of the government plan always speak about. But after more than five years it hadn’t worked. There are a number of reasons for the low level of contributions, and not all can be attributed to Rafael Correa and his scepticism. The main explanation for the lack of support by prospective donors, even those sympathetic to the proposal, was the fear that to fund it would open the door to hundreds of similar proposals. And while there is nothing wrong with that from an environmental standpoint, financing myriad proposals was not exactly what they had in mind. Despite the flow of fine words, they were afraid of the Yasuní-ITT proposal. 6 . It is worth remembering that the first trust set up to receive donations was designed, among others, by Yolanda Kakabadse, president of the World Wide Fund for Nature and trustee of the Ford Foundation, and businessman-environmentalist Roque Sevilla, both well connected in the NGO conservation world. They proposed that the money from the ITT plan be managed by national NGOs, but they almost certainly weren’t thinking of the radical NGOs that first proposed the idea of leaving the oil in the ground. Donor governments meanwhile, as tends to happen with their international aid agencies, wanted to control the destination of the funds. Telling them to “stick their pennies in the ear” was not exactly diplomatic (who expects that of Rafael Correa?) or designed to please potential donors, but it was an expression of sovereignty. The outburst may not have helped, but it seems unlikely that that was why the proposal failed. One of the most worrying aspects of the Yasuní-ITT proposal was to finance it through the carbon bond market, a mechanism that allows major polluting states to continue emitting carbon dioxide in exchange for financing conservation projects in other parts of the planet. The plan left them “free” to continue contributing to climate change, probably the most serious threat to the entire world that exists (to say “serious” is to understate the catastrophic danger it represents). According to some experts, climate change could even cause large areas of the Amazon to dry up. It was a real contradiction. 7. Ivonne Baki, the chief negotiator, did not represent the best choice to raise funds for the Yasuní-ITT proposal. I am sure she had fun, and at least raised more than she and her team spent, but she was hardly the best option. Her environmentalism does not go very deep. I say that despite the fact that some of her team supported her because she spoke 25 languages and was an excellent negotiator -- a statement hard to dispute given that she has occupied high-level posts in three recent governments of quite different political stripes: those of Jamil Mahuad, Lucio Gutierrez and now Rafael Correa. It is a feat matched by very few. 8. To say that the real problem is capitalism has its merits, but it suffers from level confusion. Capitalism may be destroying the planet. The problem with the argument is that we have to decide the fate of the Yasuní-ITT proposal now, and while talking about the role of capitalism can help in understanding the essential nature of the problem, it will not help a great deal in making a decision in the immediate present. And I doubt that capitalism will fail before the ITT oil fields give out. 9. Even though the minister for strategic resources, Rafael Póveda, may deny it, the ITT oil fields have always been considered to be one of the two major possible sources of oil for the proposed Pacific refinery. Without it -- or without crude imported from Venezuela -- there would not be enough volume to justify the construction of the refinery. That Ecuador needs a new refinery has never been a matter of great debate given that importing derivatives such as diesel or lubricating oil is extremely costly for the country. Depending on the quality of the lubricant, 10 or more barrels of crude have to be exported to import one single barrel. Imported diesel is also subsidised in Ecuador at a rate of roughly 2.3 to 1. So it is not difficult to understand the pressure to reduce costs by producing in the country rather than importing. One political drawback is that if the ITT oil is finally processed in the new refinery, to derive any real financial benefit and justify extracting the oil in the first place, any government would have to dramatically reduce or eliminate the internal subsidies on gasoline and diesel etc. It will not be easy. 10 . Not exploiting the ITT fields does not imply an end to “extractivism”: i.e. an excessive dependency on the export of unprocessed natural resources. It could be a step in that direction, but with this government that seems unlikely. There are two basic options for reducing dependence on primary resources: reduce the amount of resources exploited, or increase the contribution of the other areas of the economy to gross domestic product. The current government is clearly committed to the second alternative. According to that particular perspective, any “loss” of income from ITT would need to be offset by other sources, mining for instance. With regard to extractivism, the possible signing of a trade agreement with the European Union is more problematic than exploiting ITT. The general tendency of so-called free trade agreements is for the more economically powerful partner to give preference to the importation of raw materials rather than manufactured goods or services that might undercut its own economy, thus tending to consolidate the resource dependency of their “partners” rather than helping them develop their own industrial and service sectors. 11. If Yasuní will neither be “destroyed” or “saved”, no matter what the final decision about exploiting the ITT fields is, then it seems fair to ask what the debate is really all about. Apart from the party political aspects – regional and local elections are scheduled for February 2014 – it is about assessing three things: a) the extent to which extracting the oil may contribute to greater damage to the national park and its biodiversity; b) calculating, or rather guessing, the real revenues to be gained from exploiting the fields, and what will be done with that money; and c) the impact developing the fields might have on isolated Indigenous groups that live in the area. None of the three aspects is clear cut. We can quantify the land affected by the oil infrastructure with a fair degree of certainty, but we do not know how many spills there might be, and how they might affect the biodiversity of the area. Although any spill will clearly be negative, much will depend on how many take place, how much oil is spilled, how quickly that oil is contained and how far it spreads from the site of the accident. It is estimated that in the Block 43-ITT area there are 2000 species of insects per hectare and that some 1000 may be lost due to the deforestation caused by installing the infrastructure. But none of this is easy to check. It is a generalisation. We do not know exactly how many species there are in each hectare, or if these insects migrate, or how many are also present in other sectors of the park. Every acre clearly does not contain 2000 different species of insect. It has also been argued that the rate of endemism (plants not found elsewhere) is “quite low”. With regard to the “cost” of losing that biodiversity, we do not know how to quantify it, in part because we don’t even know what it is. Or perhaps living beings have no price. Regarding the income the country might receive, there are differences of opinion. According to official sources the income will be in the order of $18 billion (thousand million) dollars. However, much depends on the oil market price from 2017, when the crude begins to flow, and during the productive years of the ITT fields. The projection is that the fields will produce for 29 years, although that obviously depends on the rate of extraction. The income is impossible to predict, and it could be a lot less. One proverbial fly in the ointment is the likelihood of US energy self-sufficiency (it could even become an exporter) due to the exploitation of shale gas reserves and recently discovered deep water oil reserves in the Gulf of Mexico. This will undoubtedly change the scenario, although there does not appear to be a consensus about exactly how the market will react. In the event that oil prices fall more than expected, the fields would evidently be less profitable. What also remains to be seen is if the calculated reserves are consistent with real levels: the estimates are out of date. If the cost of producing the ITT field oil reaches $50 or even $60 a barrel due to its very low API -- approximately 14,it is like tar says oil consultant Henry Llanes -- profits could vanish altogether. And that is without taking into account the cost of environmental remediation, if it ever happens. It is also worth asking what will happen in five or 10 years, with another government of possibly a different political stripe. Would the current government’s commitments regarding the allocation of resources be respected? As for the presence of isolated peoples within blocks 31 and 43, this amounts to something of a mystery. We simply do not know. We know they are there, somewhere, but not where and not when. They could be at certain times in the south of blocks 31 or 43, but nobody knows for sure: no reliable studies have been done. So, given the other doubts that exist, it would probably be wise to delay the start of operations in the two blocks, especially the Ishpingo field, the most southerly of the ITT groups, and the most likely to form a part of the “territory” of the isolated Taromenane, and possibly Tagaeri Indigenous groups, until we have the necessary information. The Capuchin priest José Enrique Cabodevilla, who has lived and worked for decades in that area of the Amazon, thinks so. So do I. 12. The money received from the ITT oil will not end poverty. But it is hardly valid to argue, as some do, that if poverty has not been eradicated with all the resources available to the government in the last few years then the relatively minor ITT resources will make no difference. Ending poverty (what country has ended poverty?) does not simply depend on resources, but on the will and, more crucially perhaps, on a government's ability to change the conditions that cause it in the first place. Ending poverty? Seven years? Maybe it could have been done (a big maybe) if this were a socialist government. But it isn’t. Asking if there could be a socialist government in Ecuador at this point in time is also a valid question. While the US remains the dominant power that it is, I think that possibility is highly unlikely. That does not imply losing hope of someday living in a more equitable society and fighting to make it happen. I understand, without sharing it, the anger generated by the possible exploitation of the ITT fields. What does make me angry is seeing, as I did a few days ago a young girl of about 15, evidently poor, with a vacant look that people suffering from malnutrition often have, breastfeeding her baby. It is not that rare. Unfortunately it is an everyday occurrence somewhere in the country. It is sad, an outrage even, that this kind of poverty can still exist. And I do not say this to support the government’s position, but because I think it is a fundamental human emotion. Should we not do absolutely everything to make sure this does not happen to any human being? 13. So should the ITT fields be exploited or not? Everyone will have their way of analysing the evidence. For my part, weighing everything up, I have come to the conclusion that yes we should. But I cannot say it with much conviction. It is a limited support for a complex decision that has to be taken because we live in a far from ideal world. And, as I mentioned above, I do not support the exploitation of the fields before we know more clearly what implications this might have for the Indigenous peoples living in isolation in the area. I say yes because I do not believe exploiting the ITT fields will “destroy” Yasuní, that it is simply not true because the area is already heavily intervened. At the same time I admit that income could be less than expected, and that even in the best-case scenario it will not put an end to poverty. But it will help to some degree, especially in an area historically neglected by the state. I say yes because to propose leaving the ITT oil in the ground and not stop the exploration and extraction in Block 31 represents a total contradiction. To “save” the Yasuní, and to make certain the isolated Indigenous groups are protected, implies putting an end to all oil activities that could have an impact on the park, and at the same time reaching an agreement with the Peru government to do the same thing in their oil blocks that border Yasuní. I am not opposed to the idea. If we are going to be radical, then let us be radical. But I admit that even from the safety of Quito, doing so would represent a tremendous financial risk, a risk that would probably not be acceptable to the country as a whole. What worries me most is the future of the isolated Indigenous groups. I do not know what kind of future they have. I suspect that is not very promising. Faced with existing pressures (oil, illegal loggers and murderous confrontations with their “brother” Waorani) it is going to be very difficult for them to survive. So we have to know more about their presence in the area before starting any extraction in the ITT and Block 31 fields. There is no other ethical choice. I also worry about the many people who still live in real poverty in Ecuador. If we leave the ITT oil in the ground there will be economic consequences, and if we don’t find truly “alternative” sources of revenue to replace them, I feel I/we would need to apologise to the young girl I mentioned (and all the people like her that I have known and those who I have never seen or will see) because we did not do absolutely everything to help. Whether Block 43-ITT is exploited or not, a lot more has to be done for the poor people of the country, they cannot be abandoned for “lack of resources”. There are already proposals for other revenue sources that would help reduce poverty and provide health and education in marginalised areas: reduce subsidies, reduce oil consumption, renegotiate contracts with cell phone companies, raise more money from the haves etc. etc. (Plan “C” ). The problem is that these are not really alternative sources: the Correa government is probably already thinking about all those possibilities. What is needed is something new and unexpected, something that is not already within the government’s reach. The most creative proposal is for those who support leaving the oil underground to transfer their cell phone accounts to the national provider CNT, providing more income for the state. If the government can be convinced, and if at the same time a sufficient number of subscribers can convinced, the oil could stay underground. The beauty of the proposal is that it would be a citizen initiative, would not cost anything -- possibly a little exasperation -- and is not readily available to a government that is always looking for new revenue sources, wherever and whenever they can be found. The idea deserves strong support. The time to make it work could be found by delaying work on the ITT fields while studies are carried out to determine the real presence of the isolated groups in the area. It is fair to say, however, that at present the chances don’t seem particularly good. The rush is on to develop the fields after five years of trying to raise money internationally, and Rafael Correa isn’t noted for his patience. Of course, even if the plan worked that would still leave the problem of Block 31, the other oil fields that are affecting Yasuní, and the proposed Pacific refinery. It is a complicated business. Taromenani, el exterminio de los pueblos ocultos, http://vimeo.com/35717321. The Waorani are an Indigenous people closely related to some of the isolated groups that live in and close to Yasuní National Park. “Where is the world's greatest biodiversity? 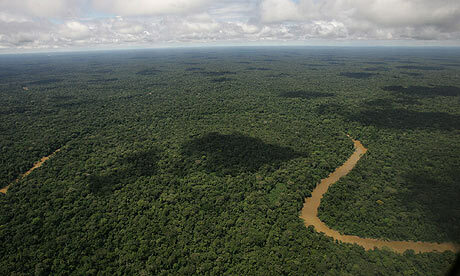 Smithsonian scientists find the answer is a question of scale”, http://www.rainforests.net/betadiversity.htm. Yasuní Rainforest Campaign/Save America's Forests news story, May 25, 2007, http://www.saveamericasforests.org/Yasuni/News/ITT/Index.html. In the Gutiérrez Government (2002-2004), Baki was Minister of Foreign Trade. API is a measure of the density of the crude. API is the American Petroleum Institute's inverted scale for denoting the “lightness” or “heaviness” of crude oils and other liquid hydrocarbons. Calibrated in API degrees (or degrees API), it is used universally to express a crude's relative density in an inverse measure, the lighter the crude, the higher the API gravity, and vice versa because lighter the crude the higher its market value. Oil with API greater than 30º is termed light; between 22º and 30º, medium; below 22º, heavy; and below 10º, extra heavy. Asphalt on average has an API gravity of 8°, Brent Crude of 35.5°. The Business dictionary, http://www.businessdictionary.com.